Enables you to evenly distribute the session load among RD Session Host servers in a load balanced RD Session Host server farm. This database contains information about the farm. Since it resides on a single machine, no other broker server would be able to read or modify the database. In order to configure HA, we will need to run a wizard which will take this database and place it on a SQL server. Once there, multiple broker servers can talk to the database directly. 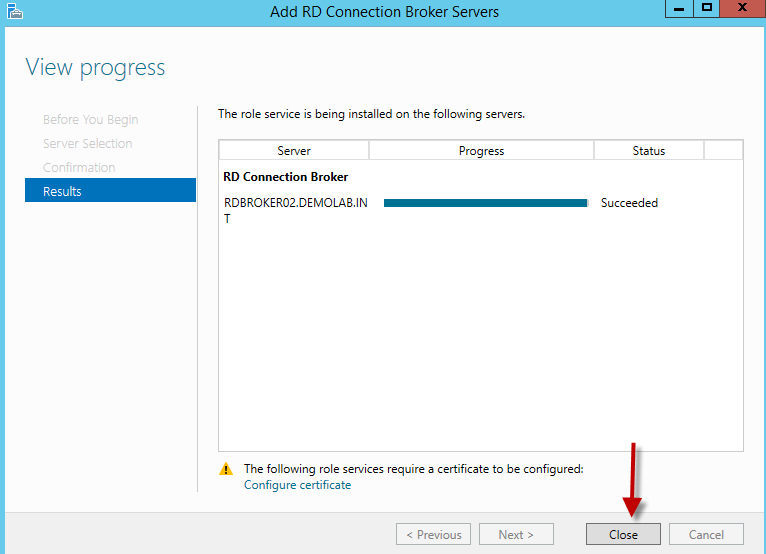 The following is a step by step guide on how to configure HA (Active/Active) for the RD Connection Broker servers in a 2012 RDS farm. Access to DNS – A new host record will be required in DNS. This record will be used to round robin the RD broker servers. Please remember to add each of the servers being used in the RDS Farm to Server Manager in order to have the ability to configure them. 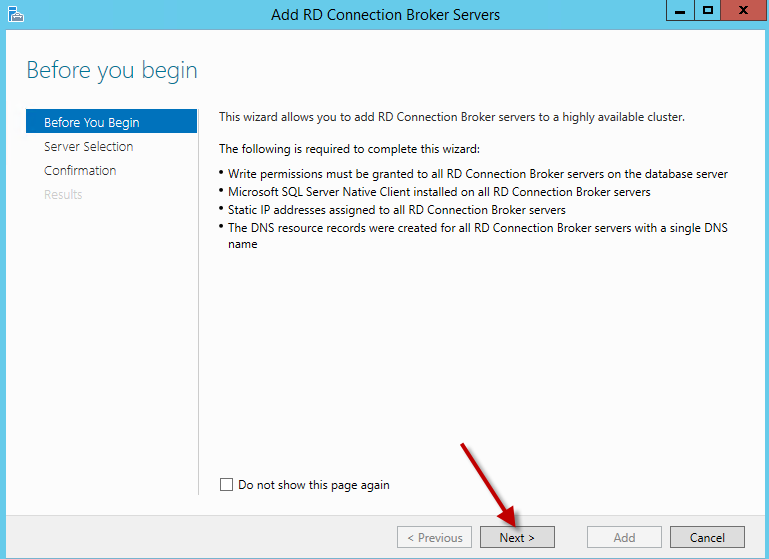 Create a new Host record in DNS which will be used for DNS round robin for the broker servers. Do this for each of the IP addresses of the RD Connection Broker servers which will be used for HA. In this example we are using the DNS name of RDFarm.DemoLab.int. Add each broker server’s computer account to this new group. 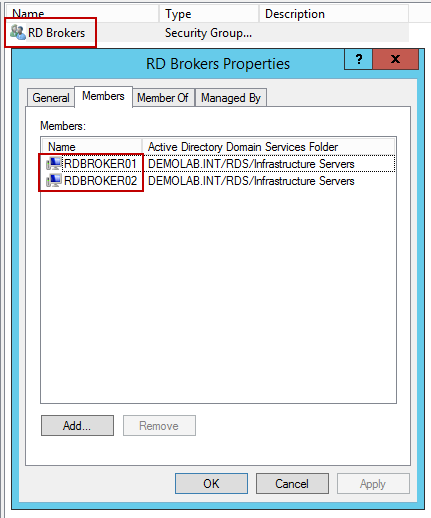 The broker servers in this example are RDBROKER01 and RDBROKER02. 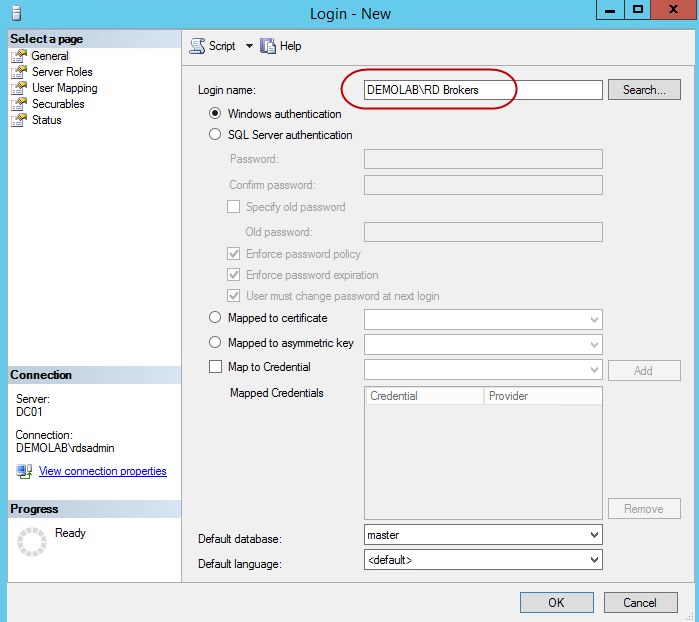 From the SQL server, add the newly created security group as a new SQL login. On the Server Roles for this login, add the role dbcreator. On each of the Broker Servers, install the SQL client tools. This can be found with the SQL installation media. 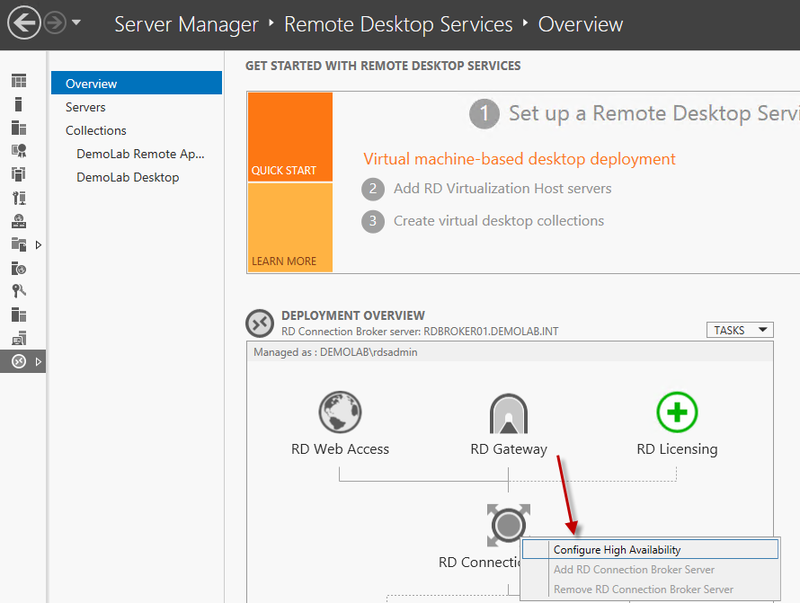 From Server Manager, go to the Remote Desktop Services Group, right click on RD Connection Broker and choose Configure High Availability. A wizard will be launched. On the before you begin screen, hit next. If the DNS name is not resolvable, you will be notified and prompted to continue. If you do so, you must ensure this information is added into DNS. If you get this pop-up, this means the DNS host record for RDFarm.DemoLab.int was never added. Please ensure this new host record is added to DNS. Verify the items on the confirmation screen and hit Configure. HA is now enabled for the RD Connection Brokers in the farm. Before we begin adding additional brokers, we must first change the permissions to the newly created database. Within SQL, go to the properties of login RD Brokers which we added early. Within there, select user mappings. 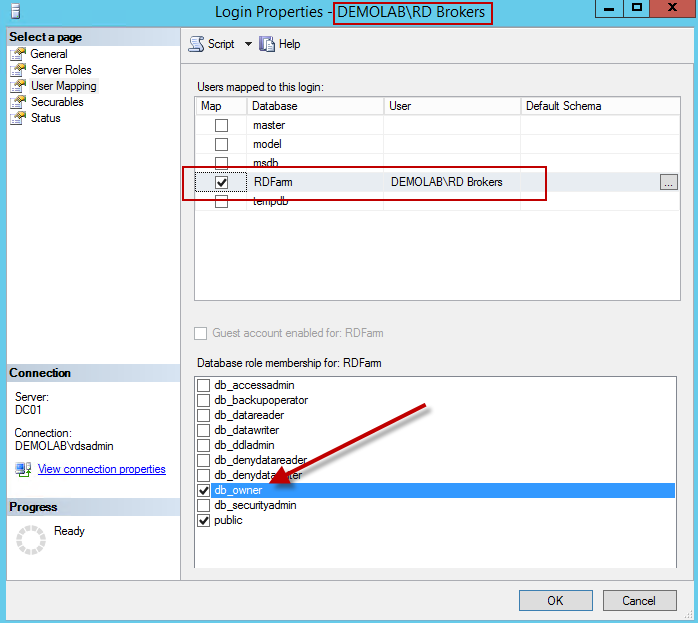 Select the RD Farm database and set the database role membership to db_owner. Hit OK to exit. 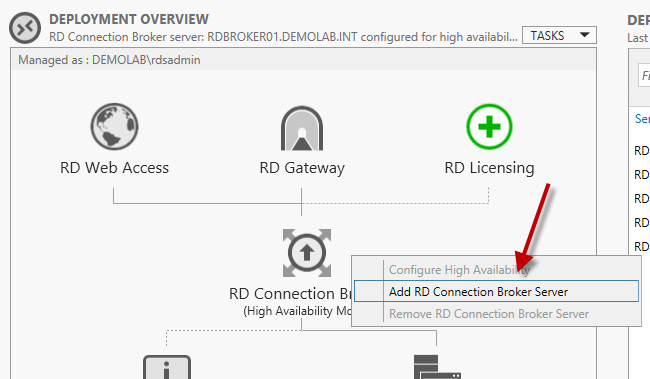 With the correct database permissions configured, we are ready to add another RD Connection Broker. 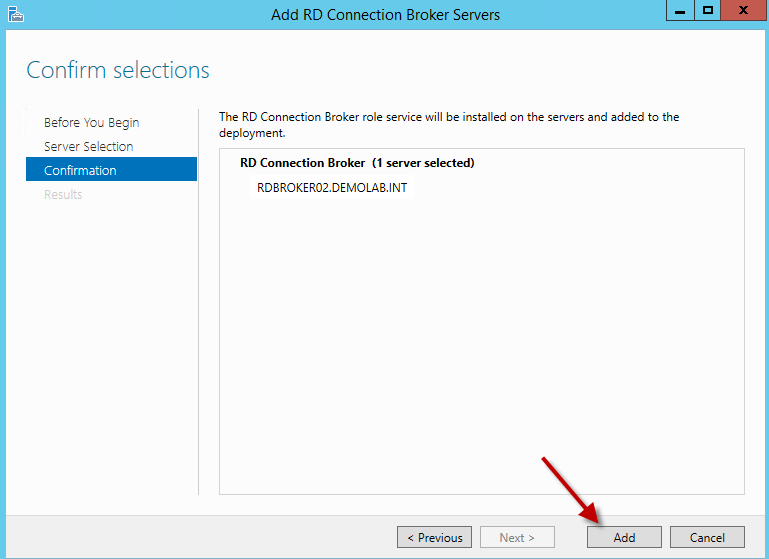 Go to Server Manager\Remote Desktop Services, right click on RD Connection Broker and choose Add RD Connection Broker Server to add your new broker server(s). And don’t forget to add the new brokers IP addresses to your DNS Round Robin Name as well make sure to add the broker server’s computer accounts to the Active Directory computer group you created earlier. 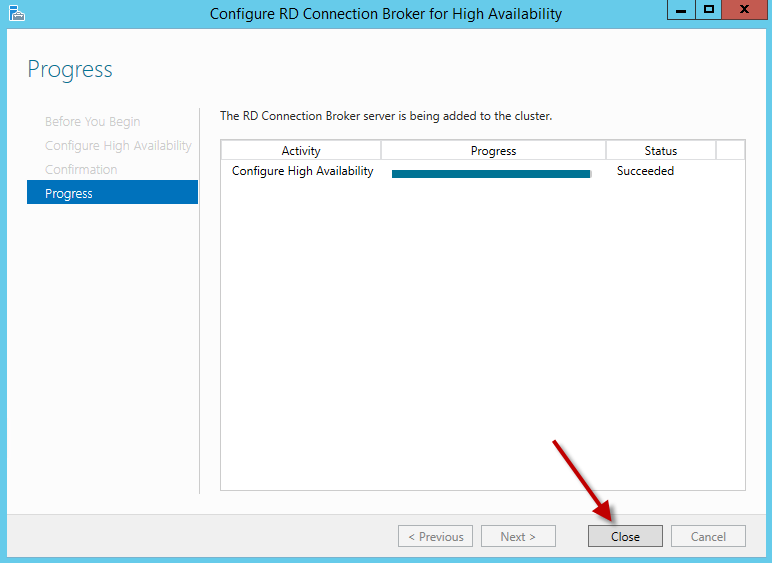 Select and add the designated broker server and hit next. On the confirmation screen, hit Add. Once the configuration is completed, we will now need to reapply the certificates for Single-Sign On and Publishing. This certificate will be required on all broker servers. 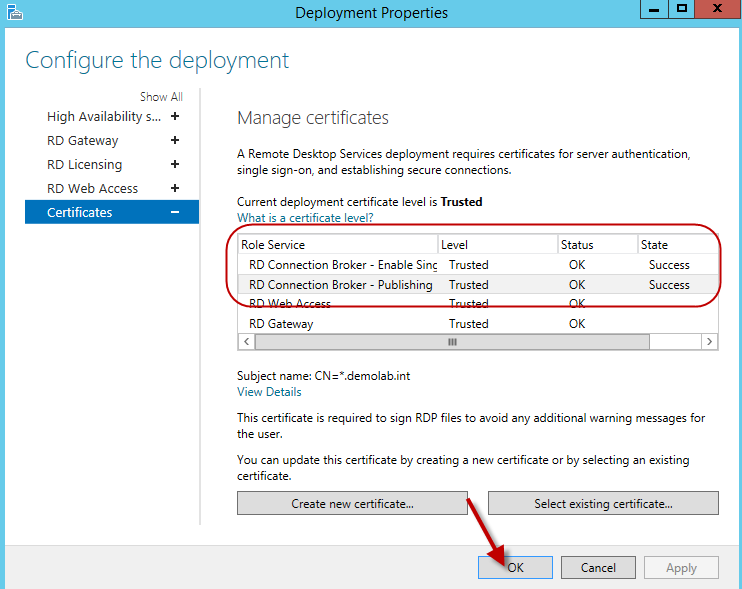 Select the option configure certificates. As you can see it now lists an error for the broker certificates. 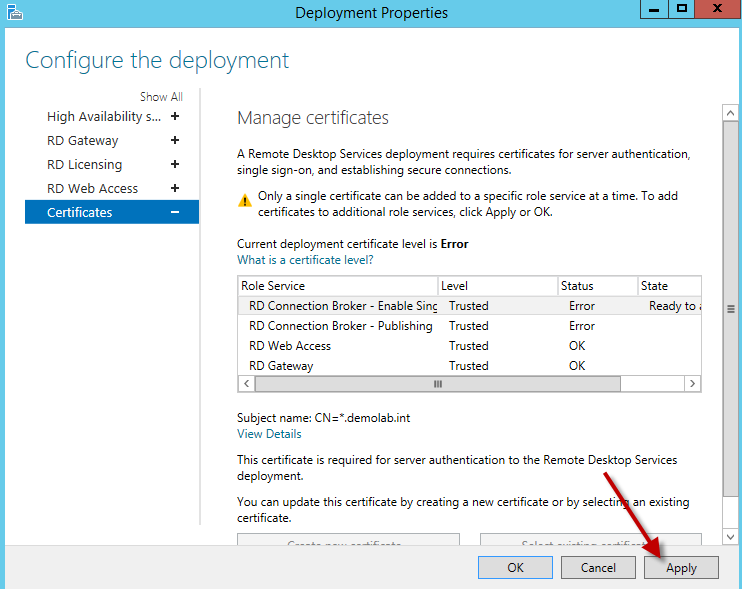 Since I have already pre-created my certificates, highlight Enable Single-Sign On and hit the button “select existing certificate”. Hit Apply to assign the certificate. 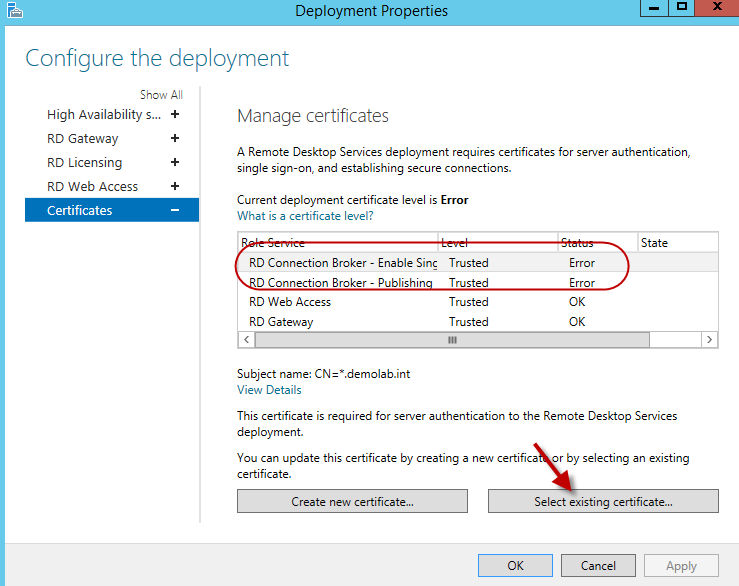 Do the same for the RD Connection Broker – Publishing certificate. Once completed with the certificate installation, hit OK.
Now that the certificates are applied, close out of the wizard. 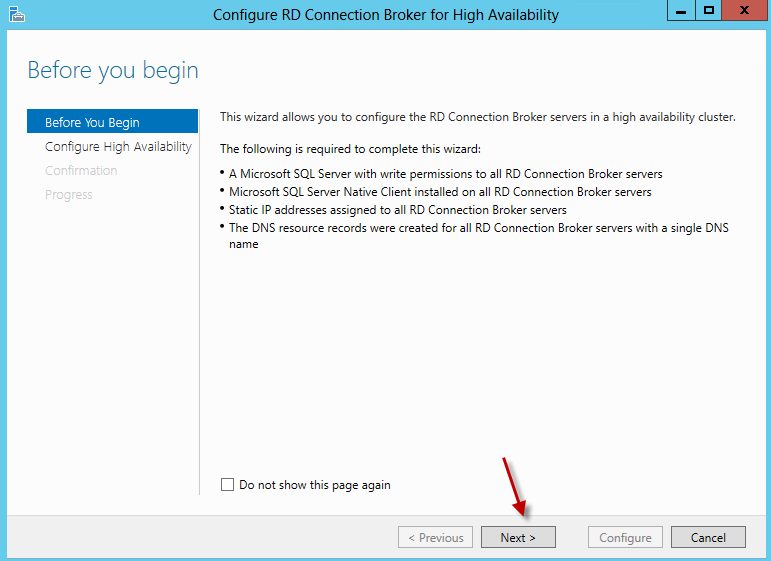 The RDS Farm is now configured with two highly available RD Connection broker servers. 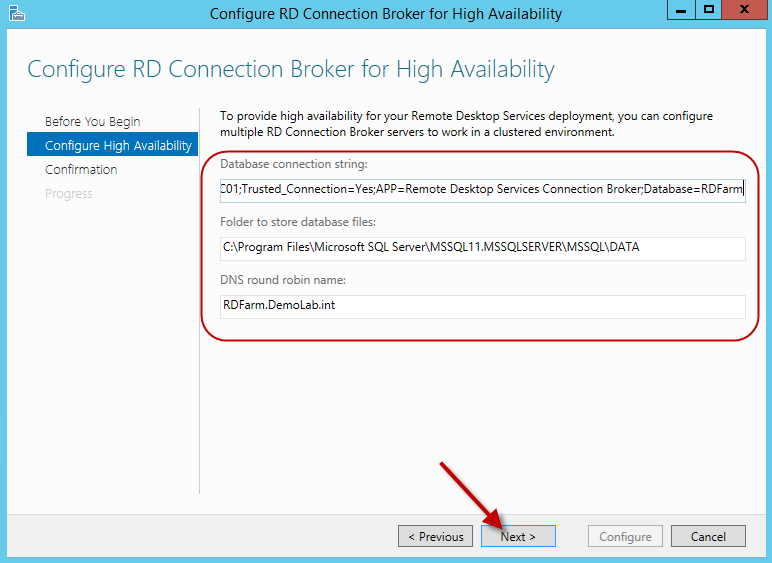 Should you be using a RD Gateway server for the environment, take a look at the steps to configure the RD Gateway server(s) for a RD Farm with HA enabled on the Broker servers. This entry was posted on February 2, 2014, 6:09 pm and is filed under MICROSOFT. You can follow any responses to this entry through RSS 2.0. You can leave a response, or trackback from your own site. 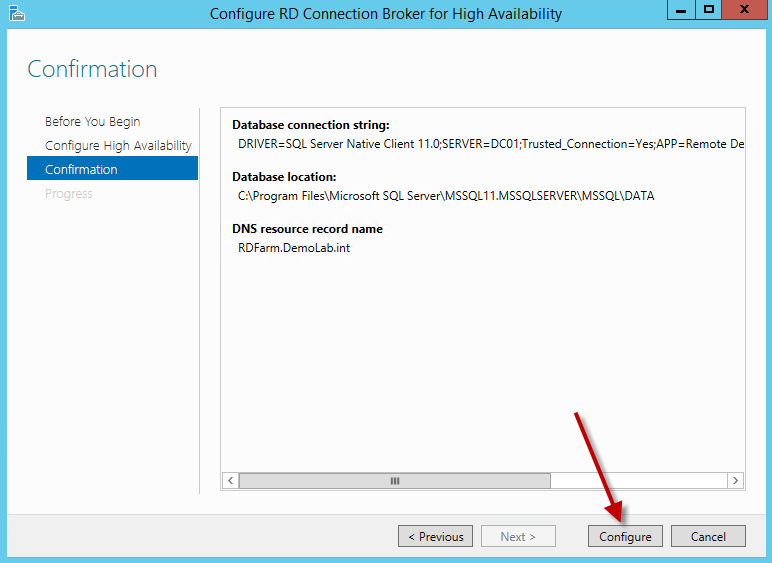 I have managed to setup RD connection broker HA using SQL 2012 in my lab. only issue I have is with the firewall. Have opened 1433 still don’t work?.For now I have disable domain firewall setting on my SQL box. Instead of using DNS round robin can you setup as NLB? But if you setup as NLB and add the 2 RD connection brokers to the NLB cluster. you can only connect to the brokers session not the RDHS servers in collection or do you add the RDHS servers to the NLB? Thanks! When a connection is made to the farm, it is the broker’s responsibility to send the user to the specific RDSH server. 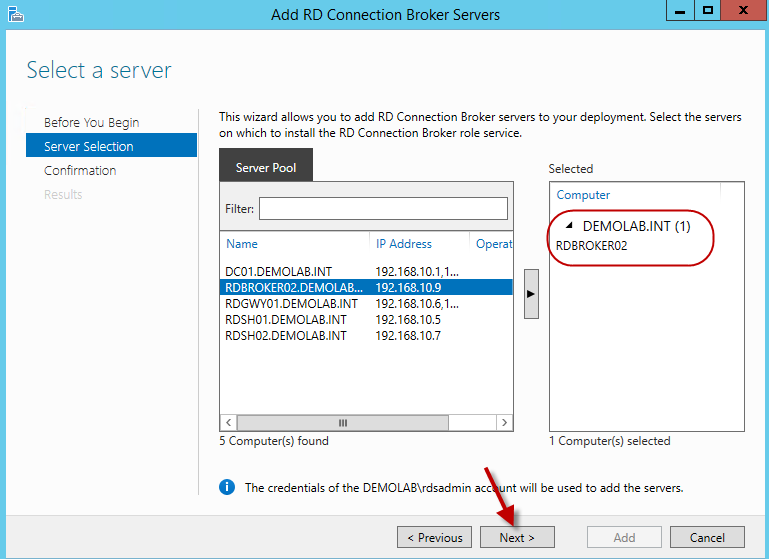 So the user never initially connects to a specific RDSH server but instead the connection starts out with the Broker and the broker passes the session off to the specific RDSH server. I’m not a huge fan of DNS Round Robin since DNS will not be aware if a server went offline. I prefer using a load balancer (hardware or software based)for the RD Connection brokers since it would know when a server was offline or unavailable. Also, how are you trying to connect to the published resource in the collection? are you connecting via RD Web Access? In our current 2008R2 environment. we deploy the RDP icon to user desktop via GPO. After reading your post. Now I understand in 2012. the broker’s responsibility to send the user to the specific RDSH server. We do have a hardware load balancer. If we use hardware load balancer. during the setup of connection broker HA . Do we specify the load balancer FQDN in the following step? “DNS Round Robin Name:” ? is there anything thing I need to be aware of using Hardware load balancer ? The load balancer would replace the need of using the DNS round robin name. So you would use the FQDN for the VIP in the Load balancer instead of the dns round robin name. So you don’t change the FQDN round robin DNS name “RDFarm.DemoLab.int” with the FQDN for the VIP in the Load balancer ? The DNS Round Robin FQDN is just a pointer to the RD Connection Brokers. So if you use a hardware load balancer, the FQDN for the VIP would be the same, just a pointer to the RD Connection Brokers but with the load balancer, it will be able to detect if one of the connection brokers is offline or not. The purpose of the load balancing is simply to ensure one of the connection brokers is not overloaded with users trying to access their RemoteApps/Desktops. So to answer your question, use the FQDN for the VIP of the Load balancer used for the connection brokers. 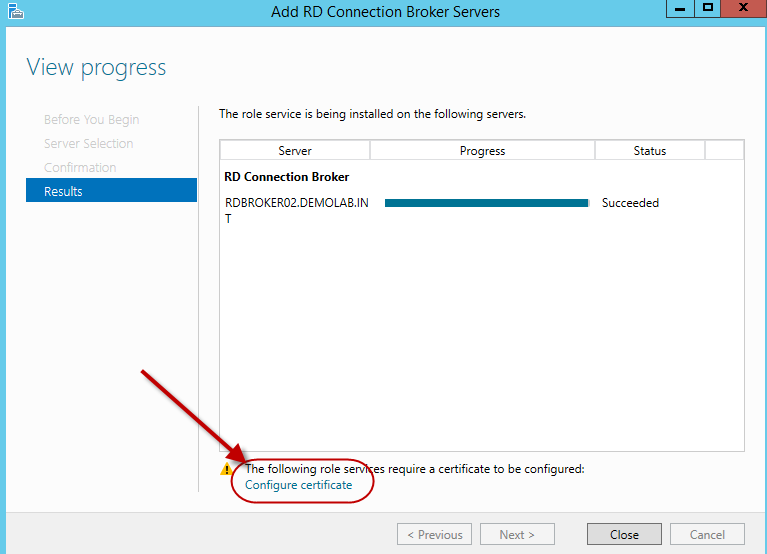 Before adding the second Broker, has the broker server role has already installed on the server? or the process installs this role automatically. What about he webAccess role? The first broker is also WebAccess server, I’d like to install WebAccess on second broker too and configure WebAccess farm at the same time. Is it possible? The process will add the role to the second server for you. 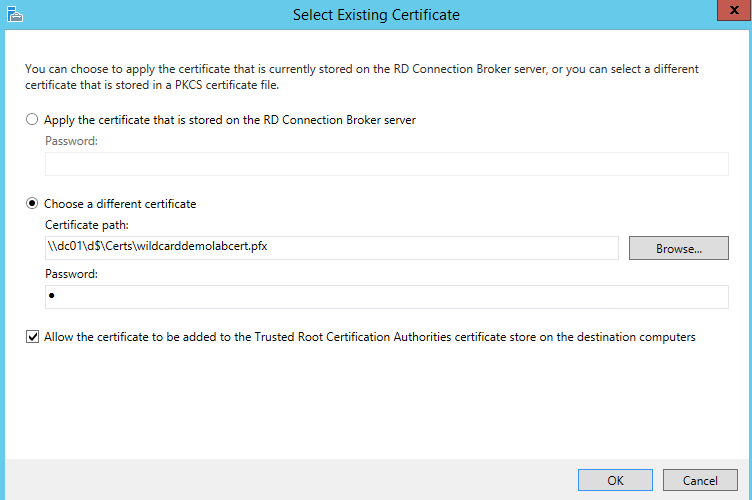 And yes, you can definitely install the RD Web Access role on the second broker as well. I need to do Virtual machine based RDS with HA. So i tried the steps mentioned above and done collection creation with one desktop. Collection alone can see in other machine when one shutdown but the desktop in that collection is not shown under collection. But i can see that desktop in Hyperv manager and failover cluster manager (because of cluster i hope). Please let me know whether the above setup will support Virtual machine based desktop deployment or need to do anthing additionally to achieve. Are you not seeing the desktop in the collection from one of the broker servers? Or is it not showing up on either broker? Can you use SQL Express for the HA purposes? Which link talks about HA requirements? You should be able to; however, by using SQL express you will lose the HA options for the sql database itself which you would have with the full version of SQL. Hi- I have the CB HA setup using “Always On”. I would like to switch this to use SQL mirroring – do I need to setup again the Connection Broker environment or could I just update the exisiting connection string to use mirroring? I have a DNS entry called Cloud that points to Cloud01. How do I get our AD security group STC to only get brokered to the STCloud collection and get the AD security Cloud group brokered to the Cloud collection. When I add those groups to the User groups to the collection, the STCloud group gets denied access. Is this because the Broker is in the Cloud collection? Am I supposed to not have the broker assosciated with a collection? I would first start by removing the broker from the collection. This may be causing the access denied error. Let me know how it goes. I reomved the broker and everything is working. What is up with temp profiles? We are having a terrible time trying to figure out why we are randomly getting them. There is no pattern and it is random who will get one. Out of 200 RDS users we get about 15 of them a day. We have a physical SSD server housing the upd’s. Is there something we can do to prevent this from happening? Is there a GPO associated with this? Glad its working. Any errors on the servers when the user gets a temp profile? !!!!!! !========> REBOOT THE BROKER SERVERS <==========!!!!!!! 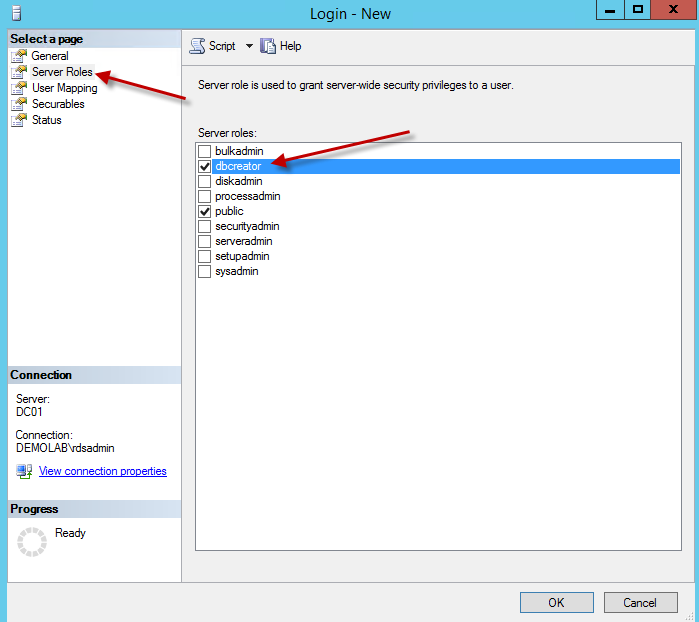 Without this when you try and configure high availability SQL Server does not see the members of the group and rejects the individual machine logins. After a reboot all is well, but it took hours trying to figure out why it didn't work, and dozens of forums suggest this is a common problem, with very few having a clue why or suggesting an actual working resolution. Please update this article as it is a great piece but burned 2 hours of my life I'll never get back for that one sentence. great article! Can a SQL Server be on the same server as one of the connection brokers? Can we use SQL Express?